Petula Clark, CBE (born Sally Olwen Clark; 15 November 1932) is an English singer, actress and composer whose career has spanned seven decades. Clark was born to Doris (née Phillips) and Leslie Norman Clark in Epsom, Surrey, England on 15 November 1932. Both of her parents were nurses there at Long Grove Hospital. Her mother was of Welsh ancestry and her father was English. Young Sally's stage name of Petula was invented by her father, Leslie Clark; he joked it was a combination of the names of two former girlfriends, Pet and Ulla. During the war Clark lived with her sister at the home of their grandparents in South Wales, in a small stone house with no electricity, no running water and a toilet at the bottom of the garden. Her grandparents spoke little English and Clark learned to speak Welsh. Her grandfather was a coal miner. Her first ever live audience was at the Colliers' Arms in Abercanaid, near Merthyr Tydfil . As a child Clark sang in the chapel choir and showed a talent for mimicry, impersonating Vera Lynn, Carmen Miranda and Sophie Tucker for her family and friends. Her father introduced her to theatre when he took her to see Flora Robson in a 1938 production of Mary Tudor; she later recalled that after the performance "I made up my mind then and there I was going to be an actress. ... I wanted to be Ingrid Bergman more than anything else in the world." However, her first public performances were as a singer, performing with an orchestra in the entrance hall of Bentall's Department Store in Kingston upon Thames for a tin of toffee and a gold wristwatch, in 1939. From a chance beginning at age 9, Clark would appear on radio, film, print, television and recordings by the time she turned 17. In October 1942 the 9-year-old Clark made her radio debut while attending a BBC broadcast with her father. She was there trying to send a message to an uncle stationed overseas, but the broadcast was delayed by an air raid. During the bombing, the producer requested that someone perform to settle the jittery theatre audience, and she volunteered a rendering of "Mighty Lak' a Rose" to an enthusiastic response. She then repeated her performance for the broadcast audience, launching a series of some 500 appearances in programmes designed to entertain the troops. In addition to radio work, Clark frequently toured the United Kingdom with fellow child performer Julie Andrews. Nicknamed the "Singing Sweetheart", she performed for George VI, Winston Churchill and Bernard Montgomery. Clark also became known as "Britain's Shirley Temple" and was considered a mascot by the British Army, whose troops plastered her photos on their tanks for good luck as they advanced into battle. While performing at London's Royal Albert Hall in 1944, Clark was discovered by film director Maurice Elvey, who cast her as precocious orphaned waif Irma in his weepy war drama Medal for the General. In quick succession, she starred in Strawberry Roan, I Know Where I'm Going!, London Town, Here Come the Huggetts, Vote for Huggett and The Huggetts Abroad, the second, third and fourth of four Huggett Family films based on a British radio series. Although some of the films she made in the UK during the 1940s and 1950s were B-films, she worked with Anthony Newley in Vice Versa (directed by Peter Ustinov) and Alec Guinness in The Card as well as the aforementioned I Know Where I'm Going! which is a Powell and Pressburger feature film now generally regarded as a masterpiece (Clark's part was small). In 1945 Clark was featured in the comic Radio Fun, in which she was billed as "Radio's Merry Mimic". Clark felt that she played child parts for too long. In 1946 Clark launched her television career with an appearance on a BBC variety show, Cabaret Cartoons, which led to her being signed to host her own afternoon series, titled simply Petula Clark. Pet's Parlour followed in 1949. In 1947 Clark met Joe "Mr Piano" Henderson at the Maurice Publishing Company. The two collaborated musically and were linked romantically over the coming decade. In 1949 Henderson introduced Clark to Alan A. Freeman who, together with her father Leslie, formed Polygon Records for which she recorded her earliest hits. Clark had recorded her first release that year, "Put Your Shoes On, Lucy", for EMI. Because neither EMI nor Decca, for whom she also had recorded, were keen to sign her to a long-term contract, her father, whose own theatrical ambitions had been thwarted by his parents, teamed with Freeman to form the Polygon record label in order to better control and facilitate her singing career. This project was financed with Clark's earnings. She scored a number of major hits in the UK during the 1950s, including "The Little Shoemaker" (1954), "Majorca" (1955), "Suddenly There's a Valley" (1955) and "With All My Heart" (1956). "The Little Shoemaker" was an international hit, reaching No. 1 in Australia, the first of many No. 1 records in her career. Although Clark released singles in the United States as early as 1951 (the first was "Tell Me Truly"/"Song of the Mermaid" on the Coral label), it was 13 years before the American record-buying public discovered her. Near the end of 1955, Polygon Records was sold to Nixa Records, then part of Pye Records, leading to the establishment of Pye Nixa Records (subsequently simply Pye). This turn of events effectively signed Clark to the Pye label in the UK, for whom she would record for the remainder of the 1950s, throughout the 1960s and early into the 1970s. During this period, Clark showed a keen interest for encouraging new talent. She suggested Henderson be allowed to record his own music, and he enjoyed five chart hits on Polygon/Pye between 1955 and 1960. In 1957 Clark was invited to appear at the Paris Olympia where, despite her misgivings and a bad cold, she was received with acclaim. The following day she was invited to the office of Vogue Records to discuss a contract. It was there that she met her longtime publicist, collaborator and future husband, Claude Wolff. Clark was attracted immediately, and when she was told that she would work with him if she signed up with the Vogue label, she agreed. In 1960 she embarked on a concert tour of France and Belgium with Sacha Distel, who remained a close friend until his death in 2004. Gradually she moved further into the continent, recording in German, French, Italian and Spanish, and establishing herself as a multi-lingual performer. While Clark focused on her new career in France, she continued to achieve hit records in the UK into the early 1960s, developing a parallel career on both sides of the Channel. Her 1961 recording of "Sailor" became her first No.1 hit in the UK, while such follow-up recordings as "Romeo" and "My Friend the Sea" landed her in the British Top Ten later that year. "Romeo" sold over one million copies globally, and was her first gold disc, which was awarded by the RIAA. In France, "Ya Ya Twist" (a French language cover of the Lee Dorsey rhythm and blues song "Ya Ya" and the only successful recording of a twist song by a female) and "Chariot" (the original version of "I Will Follow Him") became smash hits in 1962, while German and Italian versions of her English and French recordings charted as well. Her recordings of several Serge Gainsbourg songs also were big sellers. She also at this time was given a present of the song "Un Enfant" by Jacques Brel, with whom she toured. Clark is one of only a handful of performers to be given a song by Brel. A live recording of this song charted in Canada. In 1964 Clark wrote the soundtrack for the French crime film A Couteaux Tirés (aka Daggers Drawn) and made a cameo appearance as herself in the film. Although it was only a mild success, it added a new dimension—that of film composer—to her career. Additional film scores she composed include Animato (1969), La bande à Bebel (1966), and Pétain (1989). Six themes from the last were released on the CD In Her Own Write in 2007. She was the subject of This Is Your Life in February 1964, and twice more, in April 1975 and March 1996, becoming the only person to receive the television tribute three times. By 1964 Clark's British recording career was foundering. The composer-arranger Tony Hatch, who had been assisting her with her work for Vogue Records in France and Pye Records in the UK, flew to her home in Paris with new song material he hoped would interest her, but she found none of it appealing. Desperate, he played for her a few chords of an incomplete song that had been inspired by his recent first trip to New York City. Upon hearing the melody, Clark told him that if he could write lyrics as good as the melody, she wanted to record the tune as her next single – "Downtown". Hatch has subsequently denied originally offering Downtown to the Drifters. Neither Clark, who was performing in Canada when the song first received major air-play, nor Hatch realized the impact the song would have on their respective careers. Released in four separate languages in late 1964, "Downtown" was a success in the UK, France (in both the English and the French versions), the Netherlands, Germany, Australia, Italy and also Rhodesia, Japan and India. During a visit to London, Warner Bros. executive Joe Smith heard it and acquired the rights for the United States. "Downtown" went to No. 1 on the American charts in January 1965, and 3 million copies were sold in America. "Downtown" was the first of 15 consecutive Top 40 hits Clark achieved in the United States, including "I Know a Place," "My Love" (her second U.S. No. 1 hit), "A Sign of the Times," "I Couldn't Live Without Your Love," "This Is My Song" (from the Charles Chaplin film A Countess from Hong Kong) and "Don't Sleep in the Subway." The American recording industry honored her with Grammy Awards for "Best Rock & Roll Recording of 1964" for "Downtown" and for "Best Contemporary (R&R) Vocal Performance of 1965 – Female" for "I Know a Place." In 2004, her recording of "Downtown" was inducted into the Grammy Hall of Fame. Clark's recording successes led to frequent appearances on American variety programs hosted by Ed Sullivan and Dean Martin, guest shots on Hullabaloo, Shindig!, The Kraft Music Hall and The Hollywood Palace and inclusion in musical specials such as The Best on Record and Rodgers and Hart Today. In 1968 NBC-TV invited Clark to host her own special in the U.S., and in doing so she inadvertently made television history. While singing a duet of "On the Path of Glory," an anti-war song that she had composed, with guest Harry Belafonte, she took hold of his arm, to the dismay of a representative from the Chrysler Corporation (the show's sponsor), who feared that the moment would incur racial backlash from Southern viewers. When he insisted that they substitute a different take, with Clark and Belafonte standing well away from each other, Clark and the executive producer of the show—her husband, Wolff—refused, destroyed all other takes of the song, and delivered the finished program to NBC with the touch intact. 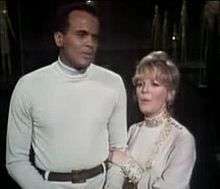 The programme aired on 8 April 1968, with high ratings and critical acclaim, and became the first instance on American television of physical contact between a black man and a white woman. To commemorate the 40th anniversary of the original telecast, Clark and Wolff appeared at the Paley Center for Media in Manhattan on 22 September 2008, to discuss the broadcast and its impact, following a showing of the program. Clark later was the hostess of two more specials, another one for NBC and one for ABC—one which served as a pilot for a projected weekly series. Clark declined the offer in order to please her children, who disliked living in Los Angeles. Clark starred in the BBC television series This is Petula Clark, which aired from mid-1966 though early 1968. Clark revived her film career in the late 1960s, starring in two big musical films. In Finian's Rainbow (1968), she starred opposite Fred Astaire and she was nominated for the Golden Globe Award for Best Actress - Motion Picture Musical or Comedy for her performance. With her role, she again made history by becoming Astaire's final on-screen dance partner. The following year she was cast with Peter O'Toole in Goodbye, Mr. Chips (1969), a musical adaptation of the classic James Hilton novella. Throughout the late 1960s, Clark toured in concerts in the States, and she often appeared in supper clubs such as the Copacabana in New York City, the Ambassador Hotel's Cocoanut Grove in Los Angeles, and the Empire Room at the Waldorf-Astoria Hotel, where she consistently broke house attendance records. During this period, Clark continued her interest in encouraging new talent. These efforts also supported the launch of Herb Alpert and his A&M record label. In 1968, she brought French composer/arranger Michel Colombier to the States to work as her musical director and introduced him to Alpert. Colombier went on to co-write the film score for "Purple Rain" with Prince, composed the acclaimed pop symphony Wings and a number of soundtracks for American films. Richard Carpenter credited Clark with bringing him and his sister Karen to Alpert's attention when they performed at a premiere party for Clark's 1969 film Goodbye, Mr. Chips. During the early 1970s, Clark had chart singles on both sides of the Atlantic with "Melody Man" (1970), "The Song of My Life" (1971), "I Don't Know How To Love Him" (1972), "The Wedding Song (There Is Love)" (1972) and "Loving Arms" (1974). In Canada "Je Voudrais Qu'il Soit Malheureux" was a major hit. Clark continued touring during the 1970s, performing in clubs in the US and Europe. During this period, Clark also appeared in print and radio ads for the Coca Cola Corporation, television commercials for Plymouth automobiles, print and TV spots for Burlington Industries, television and print ads for Chrysler Sunbeam and print ads for Sanderson Wallpaper in the UK. In the mid-1970s, Clark scaled back her career in order to devote more time to her family. On 31 December 1976, she performed her hit song "Downtown" on BBC1's A Jubilee of Music, celebrating British popular music for Queen Elizabeth II's impending Silver Jubilee. She also hosted the television series The Sound of Petula (1972–74) and, through the 1970s, made numerous guest appearances on variety, comedy and game show television programmes. In 1980 Clark made her last film appearance, in the British production Never Never Land. Her last television appearance was acting in the 1981 French mini-series Sans Famille (An Orphan's Tale). A 1981 single "Natural Love" reached No. 66 on Billboard's Hot 100 chart and No. 20 on the US country singles chart in early 1982. As Clark moved away from film and television, she returned to the stage. In 1954, she had starred in a stage production of The Constant Nymph, but it was not until 1981, at the urging of her children, that she returned to legitimate theatre, starring as Maria von Trapp in The Sound of Music in London's West End. Opening to positive reviews and what was then the largest advance sale in British theatre history, Clark—proclaimed by Maria Von Trapp herself as "the best Maria ever"—extended her initial six-month run to 13 to accommodate the huge demand for tickets. In 1983, she took on the title role in George Bernard Shaw's Candida. Later stage work includes Someone Like You in 1989 and 1990, for which she composed the score, Blood Brothers, in which she made her Broadway debut in 1993 at the Music Box Theatre, followed by the American tour; and Andrew Lloyd Webber's Sunset Boulevard, appearing in both the West End and American touring productions from 1995 to 2000. In 2004, she repeated her performance of Norma Desmond in a production at the Cork Opera House in Ireland, which was later broadcast by the BBC. With more than 2,500 performances, she has played the role more often than any other actress. A new disco re-mix of "Downtown", called "Downtown '88", was released in 1988 registering Clark's first UK singles chart success since 1972, making the Top Ten in the UK in December 1988. A live vocal performance of this version was performed on the BBC show Top of the Pops. Clark recorded new material regularly throughout the 1970s, 1980s and 1990s, and in 1992 released "Oxygen", a single produced by Andy Richards and written by Nik Kershaw. In both 1998 and 2002, Clark toured extensively throughout the UK. In 2000 she presented a self-written one-woman show, highlighting her life and career, to large critical and audience acclaim at the St. Denis Theatre in Montreal. A 2003 concert appearance at the Olympia in Paris has been issued in both DVD and compact disc formats. In 2004, she toured Australia and New Zealand, appeared at the Hilton in Atlantic City, New Jersey; the Hummingbird Centre in Toronto, Ontario; Humphrey's in San Diego; and the Mohegan Sun Casino in Uncasville, Connecticut; and participated in a multi-performer tribute to the late Peggy Lee at the Hollywood Bowl. Following another British concert tour in early spring 2005, she appeared with Andy Williams in his Moon River Theatre in Branson, Missouri, for several months, and she returned for another engagement in autumn of 2006, following scattered concert dates throughout North America. 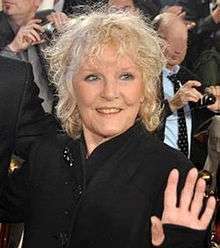 In November 2006 Clark was the subject of a BBC Four documentary titled Petula Clark: Blue Lady and appeared with Michael Ball and Tony Hatch in a concert at the Theatre Royal, Drury Lane broadcast by BBC Radio the following month. In December that year, she made her first appearance in Iceland. Duets, a compilation including Dusty Springfield, Peggy Lee, Dean Martin, Bobby Darin and the Everly Brothers, among others, was released in February 2007; and Solitude and Sunshine, a studio recording of all new material by composer Rod McKuen, was released in July of that year. She was the host of the March 2007 PBS fundraising special My Music: The British Beat, an overview of the musical British invasion of the United States during the 1960s, followed by a number of concert dates throughout the US, UK, Canada, Australia and New Zealand. She can be heard on the soundtrack of the 2007 independent film Downtown: A Street Tale. Une Baladine (in English, a wandering minstrel), an authorised pictorial biography by Françoise Piazza, was published in France and Switzerland in October 2007, and the following month Clark promoted it in bookshops and at book fairs. In 2007 Clark took part in the BBC Wales programme Coming Home, about her Welsh family history. Clark was presented with the 2007 Film & TV Music Award for Best Use of a Song in a Television Programme for "Downtown" in the ABC series Lost. 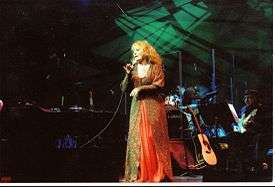 She completed a concert tour of England and Wales in summer 2008, followed by concerts in Switzerland and the Philippines. Then & Now, a compilation of greatest hits and several new Clark compositions, entered the UK Albums Chart in June 2008 and won Clark her first silver disc for an album. Open Your Heart: A Love Song Collection, a compilation of previously unreleased material and new and remixed recordings, was released in January 2009. 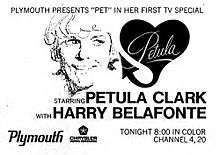 Additionally, her 1969 NBC special Portrait of Petula, already released on DVD for Region 2 viewers, is also being produced for Region 1. A collection of holiday songs titled This Is Christmas, which includes some new Clark compositions in addition to previously released material, was released in November 2009. At the Montreux Jazz Festival on 14 July 2008, Clark joined with Paolo Nutini to perform "Goin' To Chicago Blues" in celebration of Quincy Jones' 75th birthday. In 2010 Clark became president of the Hastings Musical Festival; she toured Australia, New Zealand and Quebec to sell-out crowds, and appeared on the Vivement Dimanche show on French television, where she promised a return to Paris in the new year. Her triple album Une Baladine included 10 new tracks and one new studio recording: "SOS Mozart", a writing collaboration of Gilbert Bécaud and Pierre Delanoë. Both her album set and the new recording of "SOS Mozart" were produced by David Hadzis at the Arthanor Productions studio in Geneva and appeared on the French charts. She was patron of 2011 Dinard British Film Festival. Early in 2011 the Lark Street Business Improvement District in a section of the downtown area of Albany, New York, needed a name for its logo/mascot, a graphic image of a blue lark. An internet poll was held and the winner was Petula Lark, clearly a reference to the singer of the adopted anthem of New York City's urban area, "Downtown". In November 2011, at age 78, Clark performed at the Casino de Paris, a Parisian music hall. Clark entertained for more than 90 minutes and introduced five new songs, one of which she had recently written with friend Charles Aznavour. A French album of all new material was to be released on 7 February 2012 on the Sony label, Clark's first in that language since the late 1970s. On 11 December 2011 the Saw Doctors released their version of "Downtown," featuring Clark. She appeared in the video for the song, which they recorded in Galway, and she in Paris. On 22 December 2011, the record made No 2 on the Irish chart. In February 2012 Clark completed her first New York City show since 1975. Her show featured a parody of "Downtown," an idea that came from her musical director Grant Sturiale. After the end of her season, which had to be extended due to the demand for tickets, she returned to Paris to promote her new album, before flying to Australia for a tour. She appeared as guest on Radio 4 'The Reunion' in August 2012. She released a new album titled Lost in You in January 2013. The album contains new music and some covers. She remakes her famous "Downtown," as well as performing a cover of Gnarls Barkley's "Crazy". She also performs a new song called "Cut Copy Me," which had a 14-week run in the Belgium chart. The album entered the UK national album chart at No. 24 on Sunday, 3 March 2013. Two of the songs – "Crazy" and "Downtown" were performed in Jools Holland's New Year "Hootenanny" on 1 January 2013, along with her 1966 No. 6 hit, "I Couldn't Live Without Your Love". On 20 June 2015, she appeared with the Midtown Men at the Beacon Theatre in New York City, performing "Downtown". Petula will release a new English language album in October 2016 and complete a tour of the UK to promote it. In 1955 Clark became linked romantically with Joe "Mr Piano" Henderson. Speculation that the couple planned to marry became rife. However, with the increasing glare of the public spotlight and Clark's growing fame – her career in France was just beginning – Henderson, reportedly not wanting to end up as "Mr. Petula Clark," decided to end the relationship. Their professional relationship continued for a couple of years, culminating in the BBC Radio series Pet and Mr. Piano, the last time they worked together, although they remained on friendly terms. In 1962, he penned a ballad about their break-up, called "There's Nothing More To Say", for Clark's LP In Other Words. In October 1957 Clark was invited to appear at the Paris Olympia for the Europe N°1 live radio show Musicorama. The next day she was invited to the office of Vogue Records' chairman Léon Cabat to discuss recording in French and working in France. It was there that she met the publicist Claude Wolff, to whom she was attracted immediately; and, when she was told that he would work with her if she recorded in French, she agreed. Since 2012, Clark has lived for most of the year in Geneva, Switzerland; she also has a holiday chalet in the French Alps, where she likes to ski, and a pied-à-terre in London's Chelsea. All four songs were released in 1964 in Spain on Hispavox EP "Petula Clark canta en Español" (Cat.-No. HV 27–126). ↑ "Mini-Biography". Petula Clark.net. 2000-10-28. Retrieved 2015-08-18. ↑ Clark's rendition of "Mighty Lak' a Rose" on YouTube (accessed 2011-04-23). ↑ Murrells, Joseph (1978). The Book of Golden Discs (2nd ed.). London: Barrie and Jenkins Ltd. p. 133. ISBN 0-214-20512-6. ↑ "Exploding" by Stan Cornyn, Harper Collins 2002, p. 58. ↑ "Harry Belafonte 'Speaking Freely' Transcript". First Amendment Center. Retrieved 2006-05-21. ↑ "IPCS News". Petula Clark.net. Retrieved 2015-08-18. ↑ "The real Maria – Features – Theatre & Dance". The Independent. 2006-10-29. Retrieved 2015-08-18. ↑ "New Year Honours: Success of song for Diana propels Elton John to a popular knighthood – News – The Independent". The Independent. 31 December 1997. Retrieved 2009-05-17. ↑ ": Hastings Musical Festival welcomes our new President :". hastingsmusicalfestival.co.uk. ↑ ": Festival du Film Britannique de Dinard :". Festivaldufilm-dinard.com. Retrieved 2011-12-31. ↑ Kevin Marshall (18 January 2011). "Name That Bird! – Kevin Marshall's America –". timesunion.com. Retrieved 2012-03-30. ↑ "ACTUAL ARTICLE TITLE BELONGS HERE!". petulaclark.com. Retrieved 2015-08-18. ↑ "The Saw Doctors sing Downtown – featuring Petula Clark". Petula Clark.net. 2011-12-09. Retrieved 2012-03-30. ↑ ">> IRMA << Irish Charts - Singles, Albums & Compilations >>". Irma.ie. Retrieved 2012-03-30. 1 2 3 "Fast Chat: Petula Clark goes uptown to Feinstein's". Newsday. 2012-02-02. Retrieved 2015-08-18. ↑ "Official Site". PetulaClark.net. Retrieved 2015-08-18. ↑ 23 January 2013 by Bill Lamb (2013-01-23). "Petula Clark, Age 80, Returns With Stellar "Cut Copy Me" and Upcoming Album". top40.about.com. Retrieved 2013-03-03. ↑ "Official Site - Home Page". Petula Clark.net. Retrieved 2016-09-29. ↑ "IPCS News". Petula Clark.net. Retrieved 2016-09-29. ↑ "French Record Charts". Petula Clark.net. Retrieved 2015-08-18. ↑ Fujita, Chris (2015-06-27). "Rose, Rose I Love You: The Story Of One Of China's Greatest Hits | 蛮夷Barbarian Subject臣民". Barbariansubject.com. Retrieved 2015-08-18. ↑ "Singers: Clark; Clark Esposito; Esposito and More – 11/15/07". Talkinbroadway.com. Retrieved 2011-12-31. Wikimedia Commons has media related to Petula Clark.